MADISON, Wisconsin -- A family is thankful their son is alive after a cable on a amusement park ride in Wisconsin snapped, CBS affiliate WISC reports. The incident happened at Mt. 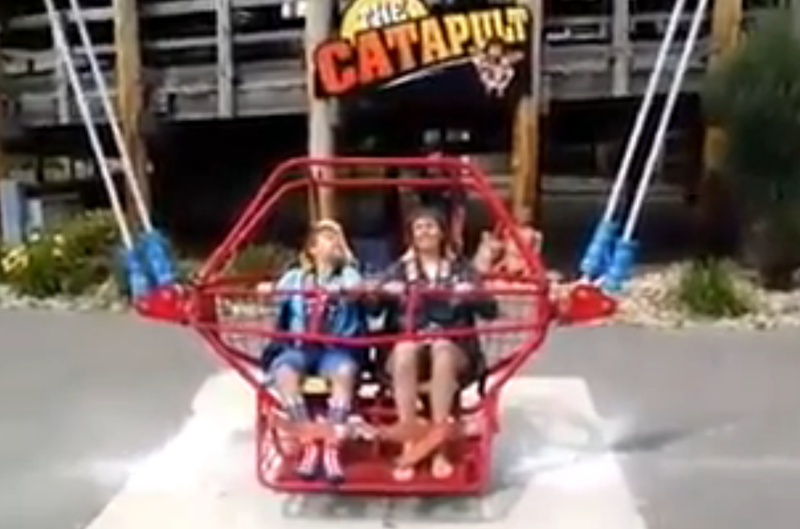 Olympus amusement park in the Wisconsin Dells Thursday on the ride called, "The Catapult." The moment the ride malfunctioned Dru Larson was filming his 13-year-old son who was on the ride. That video is now going viral. Larson's son, Trevor, and Carrie Sueker, a mom also traveling from Minnesota to a Milwaukee basketball tournament, were on the ride when the metal cable that was supposed to shoot them about 200 feet in the air at 60 mph suddenly broke. At the beginning of the video, as ride operators buckled the two into the ride, someone can be heard saying, "I'll pray for you." And then a voice adds laughing, "The ropes look a little frayed." Someone else adds, "Did they sign the insurance waiver?" Dru and Nicole Larson, Trevor's mother, told WISC they were in disbelief when the cable snapped just moments before the ride took off. "I was numb," Nicole Larson said. "You saw this cable and this mental piece coming at your son, and you were expecting your son to go in the air and all of a sudden this was coming back at you." "You look and you think 'Oh my gosh.' And then you think about what could've happened. How it could've went the other way," Dru Larson said. After it was over, Larson told WISC the owner offered the family their money back and tokens for a different ride. Casco, Inc. owns the ride, but WISC reports no one from the company has responded to requests for comment. State documents show the ride was last inspected June 17. On Friday WISC reports Mt. Olympus announced it is forcing the operator of the ride to cease operations and remove the ride.